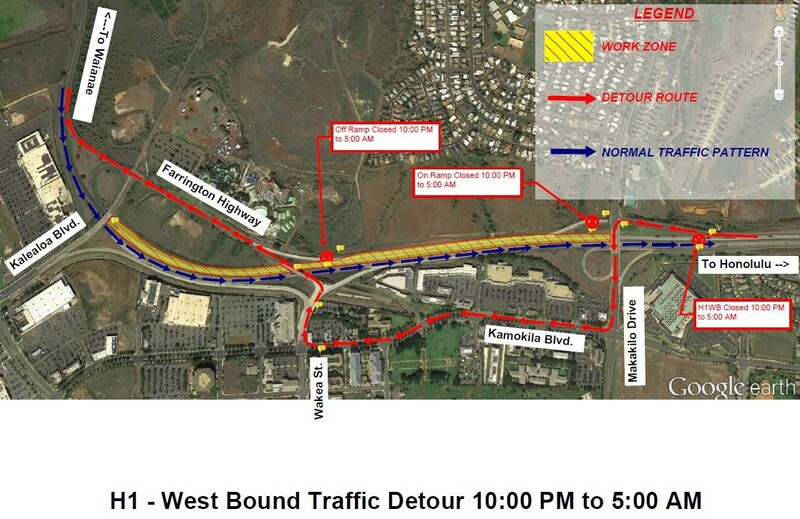 HONOLULU – The Hawaii Department of Transportation (HDOT) advises Oahu motorists that the westbound H-1 Freeway will be closed between the Makakilo Drive Overpass and the Kalaeloa Boulevard Overpass on Thursday night, Sept. 28, 2017 through Friday morning, Sept. 29, 2017 from 10 p.m. to 5 a.m.
Electronic message boards will be posted to warn motorists of the full closure. Special Duty Police Officers will be on-site to assist with traffic control. Emergency vehicles, first responders, and TheBus have been notified of the roadwork and will be allowed through the work zone. There will also be a left lane closure on the H-1 Freeway in the eastbound direction between Laaloa Street and the Farrington Highway Overpass on Friday, Sept. 29, from 9 a.m. to 3 p.m.
HDOT advises motorists to prepare for the closures by checking traffic apps, mapping the best route, and adding extra travel time to their commutes. All roadwork is weather permitting.